Add the tracks that are missing artwork to Music Tag. Select a track to download artwork for and click the "Download Artwork" button (the left most button below where the artwork is displayed). Once artwork has been downloaded, choose to either keep the artwork or cancel. Save the changes to the modified tracks to save the artwork to the file. 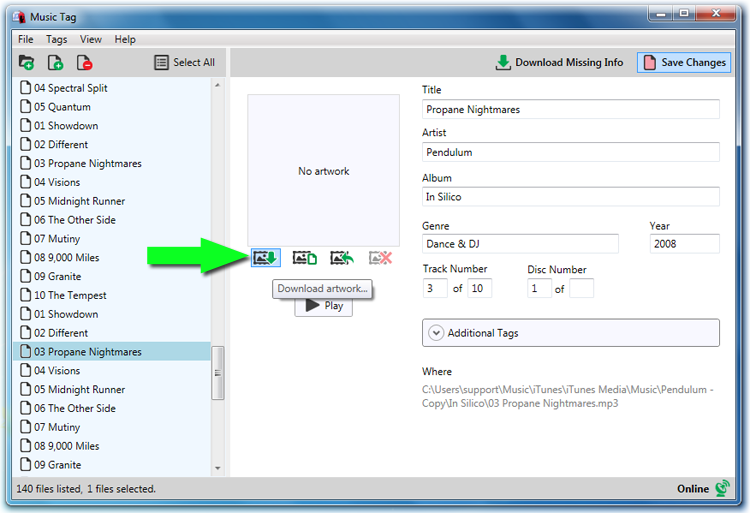 This support article details how to download missing artwork for your songs using Music Tag. Firstly, you will need to add the songs with missing artwork into Music Tag. You can do this by going 'File' -> 'Add Files...' and navigating to the location of your music. 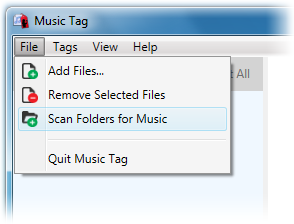 Alternatively, you can 'Scan Folders for Music' on your PC/Mac, this will search through the chosen folders and add all the music found into Music Tag. Once you have added your music into Music Tag, you can select individual tracks to see which tracks are missing artwork. 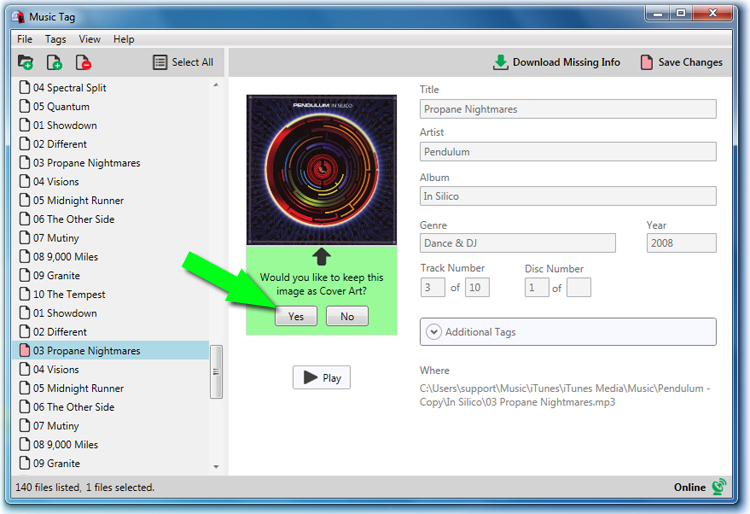 When you select a track, the song data for that track will be displayed on the right hand side of the application, you will also see the box where the artwork is displayed. If the artwork is missing, you will see the 'No artwork' message displayed in the artwork display box. 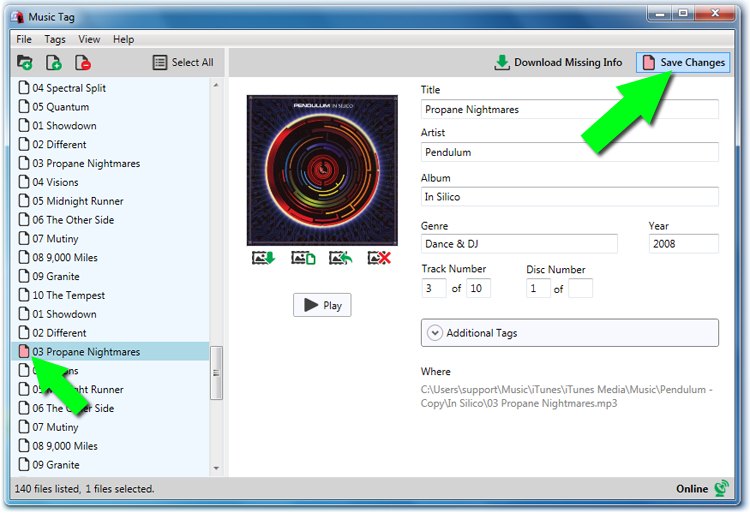 To download missing artwork for the selected track, click on the 'Download artwork...' button, located under the artwork display box, as shown below. Music Tag will then use it's advanced search techniques to find your tracks missing artwork online. Once Music Tag has found the artwork for your track, it will display the artwork for you and ask if you would like to keep the image as the cover art for this track. Select 'Yes' to add the artwork to the selected track. Finally, you should notice that all your tracks which you have added missing artwork too, or have modified in any other way, will have a red file icon. This notes that you have made changes to these tracks, but you have not yet saved the changes to your music files. For these changes to be applied to your music collection, you will need to click the 'Save Changes' button, located in the top right hand corner of Music Tag.